Ellen Miller (Paulette Goddard) works for a debt collector and has hunted the men down to serve them a collection notice. When she loses her job over their case, they decide to hire her as their manager. It turns out Ellen has a knack for this work. She books so many gigs for the Perennials that Artie Shaw (playing himself) becomes jealous! Second Chorus was directed by H. C. Potter. 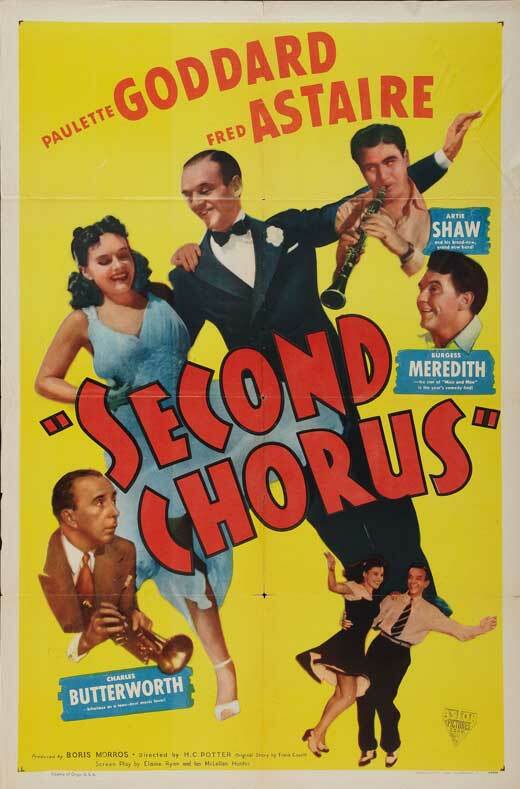 This film appears in Mill Creek’s 50 Classic Musicals DVD set. The first thing that struck me about this film was Paulette Goddard’s character. She brings a lot charm to the screen. I love the little montage early on in the film, of Ellen putting on different personalities while speaking to different clients in order to book gigs for Danny’s band. Such charisma! Astaire, of course, is a delight as well. Any reason to see him on screen is a good one — he’s a consistent performer, and even his minor films are highly watchable. Here, he sings a few songs and gets to show off his near-peerless hoofin’ skills. His dancing with Goddard is particularly lovely to watch. 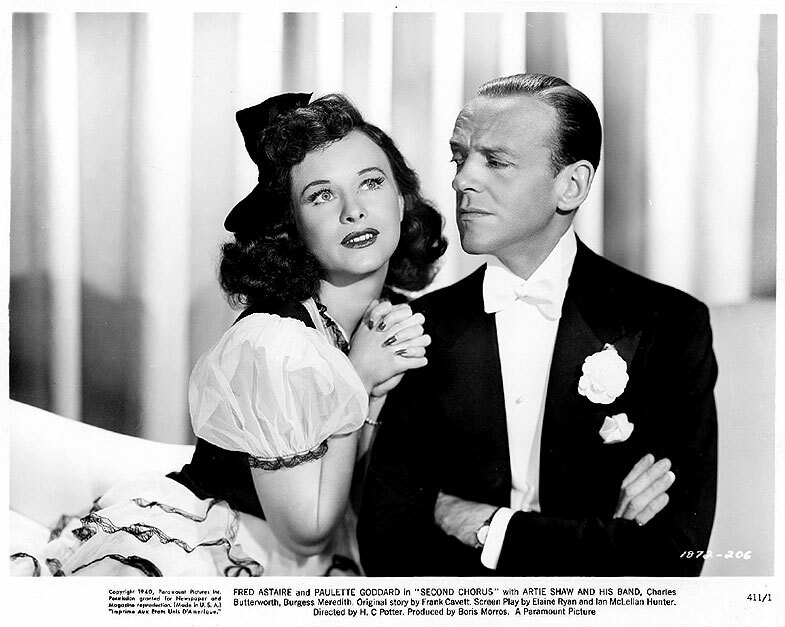 Astaire and Meredith make a surprisingly fun comedic pair, too. They’re rivals as musicians and in the quest for Ellen’s heart. The actors portray a friendship that’s highly competitive, but mischievously so. They sabotage each other with little pranks, but their feud is generally polite. Also appearing is the great Artie Shaw, along with his orchestra. Shaw appears as himself, as noted in the synopsis above. Impressed by the success that Ellen has brought to the Perennials, Artie tries to woo her into his camp, offering her a job as his booking manager. Drama ensues, as Ellen has by this time formed a close relationship with Danny and his band. Great pics, even if not one of my favorite films/musicals. I do love Paulette Goddard (aka Marion Goddard Levy). Not only is she a nice Jewish girl, but she was fabulous in The Women, and I recently learned she was Charlie Chaplin’s third wife. After Charlie? She was married to Burgess Meredith. What a wild world celebrities live in. Thanks for the fun post.